(January 3, 2014) - Many of us have had big holiday meals over the last few weeks, often times bringing a dish to share to the host’s house, but if you are ever invited to Sydney Dobson’s table you should probably arrive empty-handed. “Since I was around 14 I’ve cooked Thanksgiving and Christmas dinners. I don’t want anyone else to cook – if I’m hosting dinner, you’re getting my food,” the Hodgenville native and UK junior said. And when people do ask what they can bring, her response is about as frank as you can get. So, how did she become the master of the kitchen at such a young age? “I was tired of having scrambled burgers and peas,” she began to explain. While cooking is something that Dobson has been passionate about most of her life, her arrival in Lexington awoke her academic passions. As an all-star cheerleader for eight years, Dobson applied to the University of Kentucky because it was her dream to make the nation’s best cheerleading team. It was the only school she applied to. Dobson didn’t make the team, but that’s where her perseverance and attitude took over. One of her first moves was to join the Student Activities Board, of which she has been as active member since. It was also through SAB that the next chapter of her story unfolded. Dobson was the Director of Engaging Issues on SAB and looking for interesting events to bring to campus, when her friend brought Krochet Kids to her attention. 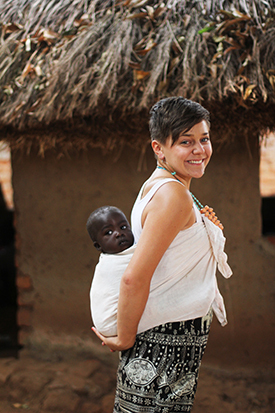 The organization assists women in poverty-stricken areas of Uganda and Peru. “It’s about empowerment and education, because these women don’t want money or aid, they want to be able to help themselves,” Dobson explained part of the non-profit’s mission. In the fall of 2012 Dobson programmed an event that brought Krochet Kids to campus, and it gave her the opportunity to meet co-founder Kohl Crecelius. At that point Dobson realized that she wanted to intern for them one day. That day came this past fall when Dobson’s friend noticed the deadline to apply for a spring semester internship was only three short days away. Dobson thought that clearly wasn’t enough time to get her application ready and submitted. Plus, she was already planning on what classes she would be taking in spring, not about travelling to Africa. But her friend encouraged and assisted her, and a few weeks later she was going through the interview process that would eventually lead to the news that she would be heading to Uganda at the start of the new year for six months. “There is the piece of it where you learn the business side of things and learn about how non-profits function,” which Dobson said she is looking forward to because of the fact that she would like to be a part of, if not run her own non-profit someday. Which makes all the more sense once you learn that Dobson is majoring in geography and minoring in gender and women’s studies at UK. That combo was a direct result of her UK Core experience. She started out pre-med, but once she took Geography 160: Lands and People of the Non-Western World, the light bulb went off – her interest in people and places, that’s something that she had always loved, but hadn’t fully connected to geography. Throw in another UK Core course, GWS 201: Gender and Popular Culture, and Dobson felt she was truly starting to hit her stride academically. So, if she ever does start her own non-profit, does Dobson have a vision for what that might look like? “I want to do something that would combine my two passions, because if I didn’t go to college I was going to go to culinary school. If I can combine something that I’ve loved my entire life with something that I’ve discovered in college – that would be it,” she said. We can’t wait to see what she cooks up. >>Learn more about Krochet Kids by reading their story. >>You can also donate to Dobson’s trip by visiting the Krochet Kids site, donating online, and specifying that your donation should go toward her trip. February 2014 update: Above is one of the photos Sydney shared with us.